NEEDED.. 1 or 2 attractive friends (man or woman but size small or medium) to model a “boot camp” shirt by the military tank this afternoon. Msg me if you are able to. Shirts provided. And I can pay you with a shirt. Thank you. Tim messaged me back with instructions on where the set for the photo shoot was. I was excited! A model? Me? Who knew? I reviewed my self-doubts noticing one particular doubt I’ve always struggled with—my non-model body. Let’s face it—being 5 feet tall with an athletic, curvy build isn’t what usually graces the front page of magazines. Instead of having a sinewy Kate Moss-like body, I am built more like Olympic gold medalist, Shawn Johnson. I convinced myself that being built like an athlete wasn’t necessarily a bad thing at all for modeling at a fitness-related photo shoot. I was going to be photographed for a race called Beast Boot Camp 5K. Perhaps I could model fitness. Perhaps my strength would come across in the photos. 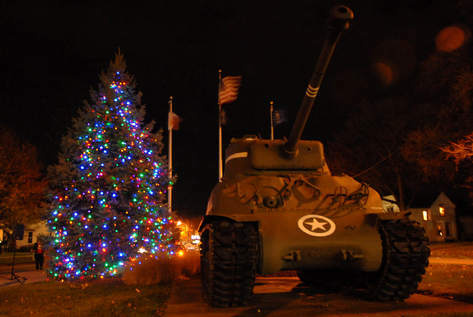 By the way, funny tidbit, those Christmas lights are still on that pine tree to the left of the tank. You can see them clearly in the daylight! Once I put on the Beast Boot Camp 5K t-shirt, I got it in my head that I should climb on top of the tank. Despite my flip-flops not making the climb an easy accomplishment, with a helpful hand from Tim I managed to monkey-climb my way up to the first level of the the tank and eventually climbed to the second, upper part of the tank. Once on top of the tank I found I had to relax and breathe to calm my initial fear of heights. After a few breaths I was able to weave my way around the tank to pose for photos like a spider on a web. Once Tim started taking pictures I found I’d left my fear of heights in the lost-and-not-wanted-anymore bin, at least for now. I felt so free on top of that army tank modeling a camouflage Beast Boot Camp 5K t-shirt. Tea with the photographer is what! In exchange for helping out my friend Tim I received the offer of tea and conversation with a friend at Sip Coffee House in Crown Point, Indiana. I never got to ask Tim about a service donation to my marathon charity. I also hadn’t seen—and still haven’t seen—the photos that he took of me atop of and next to the tank. We sat in comfy chairs at Sip, had tea and a hot cocoa and chatted. Tim gave me some much appreciated advice about my blog—to write more frequently. I’m so glad I answered Tim’s Facebook ad. I got to be a model and a friend tonight by taking a leap of faith and answering an ad I found on Facebook for a MODEL NEEDED.